That bar is amazing! Dang. Yea!!! Can’t wait to hear more. We had a “one that got away” house too. The one we ended up in is probably better in a couple ways but I still think about that one. Also, I think 1200 squirrel feet is the perfect size for lots of . . . DEEZ NUTS! Long time no see! I understand the want to have a place of your own. We have been renting for about 6 or 7 years now. I’d love to buy a place of our own here, but being military there is no guarantee that this will be our last duty station and we are already stuck with a place in North Carolina that we can’t not get rid of. The market here is rather ridiculous too. 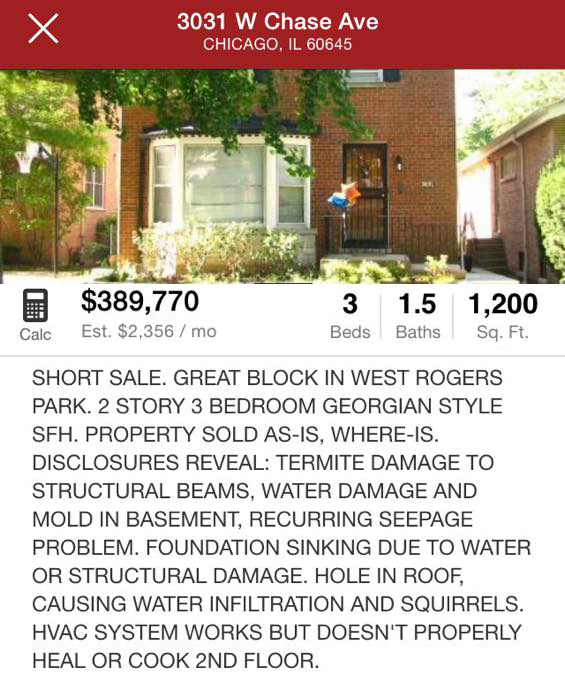 If you want something under $300,000 it seems it has to be a townhouse which we don’t want or under 1200 sq. ft, which we definitely don’t want. Don’t forget to take area taxes in mind when you make your purchase. Here they have some rather unusual taxes, such as rain taxes, where they tax ever square foot of concrete surfaces on your property and tax you for rainfall. I don’t remember the percentage right off hand. Craziness. As much as I hate apartment living, it will have to hold just until our son graduates from high school in 2016. :( Good luck in your quest for a place to call your own! Yeah! I am excited to a. hear more from you, Marti, b. see some Chicago properties, and c. follow along in the process with someone who is real with it.